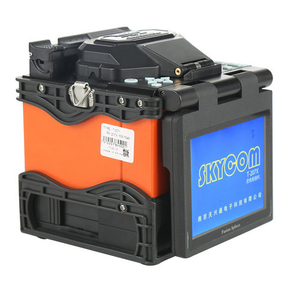 SKYCOM T-207X Optical fiber Fusion Splicer - Buy Product on Nanjing Tianxingtong Electronic Technology Co., Ltd.
> We has been dedicated to R & D, manufacturing fusion splicer for more than 5 years. > Skycom T-207X is our latest developed product.It more concise and smaller in size. > Our company have developed fusion splicer from 2010, and successfully obtained 5 patents for the fusion slicer research. > Lithium battery: rechangable and up to 180 times of continuous splice and heat after fully charged. * 1+N: one 3-in-1 fixture ( for rubber-insulated wire, fiber optic pigtail, bare fiber) & optional fixtures ( for SC/LC/FC connector - T-207XF) .